Adding to a litany of analyst predictions pointing to a larger iPhone, Timothy Arcuri of Cowen and Company (via AppleInsider) today claimed that the iPhone 6 will ship with a 4.8-inch display, a significant increase over the 4-inch display of the iPhone 5c and iPhone 5s. Citing sources within Apple's supply chain, Arcuri also indicated that the next-generation iPhone will come with the 802.11ac Wi-Fi standard that first began appearing in Apple products in 2013. 802.11ac, or "Gigabit" Wi-Fi offers speeds up to three times as fast as existing 802.11n wireless networks, reaching speeds over 1 Gigabit per second. Because 802.11ac was included in Apple's updated Mac line throughout 2013, many expected the iPhone 5s and the iPhone 5c to ship with the standard. While the chips were presumably not quite ready at the time, 802.11ac support in the Galaxy S4 and the HTC One suggests that the technology is now ready for mobile devices. Echoing several other predictions about Apple's future in mobile payments, Arcuri went on to suggest that Apple will offer "key software innovations" in 2014 with iBeacon, Touch ID, and Passbook used as a mobile payment solution. According to the analyst, Apple will launch its updated iPhone in September, which is in line with previous Apple iPhone releases. 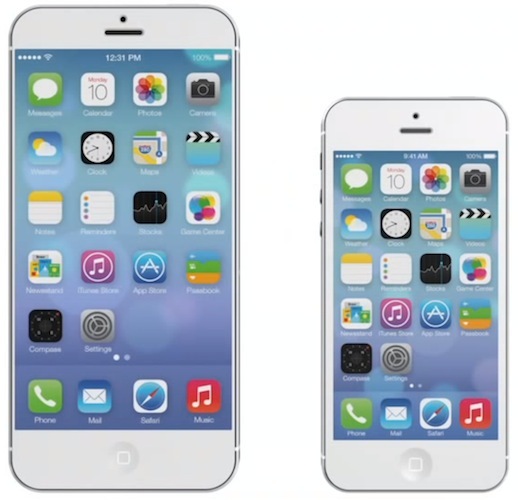 Although Arcuri does not mention dual iPhone sizes, some iPhone 6 rumors have indicated Apple could release the phone in multiple sizes ranging from 4.7 to 5.7 inches. I would love a bigger screen but with proper aspect ratio. I don't want to see a 7th row of icon. In all honesty, I'll just try and see how it fits. My wife already complains from the 4s to the 5s that she can't reach the top left corner easily anymore. And that's where a lot of apps' back button is. On Android, with a hardware back button, it makes more sense. 4.8 in display will satisfy me. After using a Galaxy Note or S4 you'll never get back to a smaller screen. It's very comfortable for typing and reading. I sincerely hope that they have multiple size options rather than just releasing one large iPhone 6. My wife and I were talking about this yesterday. I think her opinion echoes that of a lot of users. They just don't want to haul around a larger device. I'll believe it when I see it. This would be a massive issue for app developers. Not if the resolution is @3x (1704x960). Absolutely all apps would keep using the same dimensions, positions and AutoLayout constraint, except with a 3x multiplier to transform points to pixels. All developers would have to do to "optimize for iPhone 6" would be to add @3x.png assets to their project, and Xcode would automatically handle the rest. In the mean time @2x assets displayed on a @3x display would look better than @1x assets looked on the iPhone 4 display when it was released, and we'd have no letterboxing like initially with the iPhone 5. I don't know what's the likeliness from a economical/manufacturing perspective, but from a developer's perspective that'd be the most elegant way to up the resolution without jumping to the total overkill that is @4x (2272x1280). * Expand the new "Reduce White Point" feature (found in iOS 7.1b3) to be more like the f.lux jailbreak tweak!